Since 2011, Reggaetronic has been a staple to the summer season for thousands. 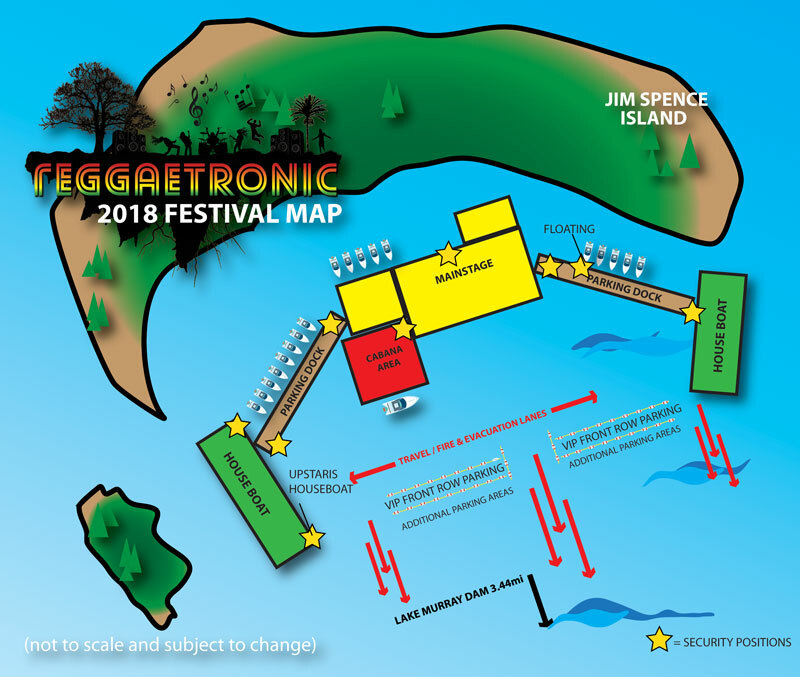 Reggaetronic is South Carolina’s longest running flotilla music festival set among the backdrop of Spence Island on beautiful Lake Murray. We are a celebration of modern reggae, funk, rock, and electronic music fostering an environment of friendship and fellowship highlighting the spirit of the Palmetto State. This 100% floating festival on the lake presents a uniqueness not seen in traditional festival configurations. Reggaetronic is produced by Electric Promotions LLC and since our inception, a portion of proceeds from Reggaetronic have benefited non-profits in South Carolina. To date, we have contributed over ten-thousand dollars to charities in the state. Reggaetronic is made possible through partnerships with outstanding national, regional, and local sponsors. Festival hours are 11:30am to 6:00pm. The festival takes place at Jim Spence Islands. General Admission Reggaetronic is FREE! All Ages are welcome.Those under 18 must be accompanied by a parent or guardian. Reggaetronic is a floating music festival, we do not touch land! We are accessible by boat only. Front row VIP parking passes can be picked up at one of the sponsored location the week of the event. You will be contacted to where you can pick up your lanyard. YOU MUST be parked on the front row by 11:00am. If you have a pass and are past the deadline time, you will not be able to park on the front row. We also urge you to stay until the show is over as this will create havoc for tie-up purposes if you leave any earlier. Please do not get a VIP pass if you plan on leaving before 6 p.m.
Reggaetronic, Electric Promotions LLC, and Breakthru Beverage has zero tolerance for illegal activities. Drug use and/or alcohol abuse is ABSOLUTLEY PROHIBITED and all city, county and state laws will be enforced by onsite law enforcement. Underage drinking will not be tolerated. Reggaetronic, Electric Promotions LLC and Breakthru Beverage is not responsible or liable for any accidents that concern individuals watercraft, BUI, and support and require adherence to ALL city, county and state laws. We are a 100% floating music festival at Spence Island, Lake Murray South Carolina. Since 2011, Reggaetronic has been a staple to the summer season for thousands. Reggaetronic is South Carolina’s longest running flotilla music. We are a celebration of modern reggae, funk, rock, and electronic music fostering an environment of friendship and fellowship highlighting the spirit of the Palmetto State. When is it this year? So… you guys are an outdoor event. Do you have a rain date set? In the event of forecasted inclement weather a rain date will be set to be announced later this year. How much is it to attend Reggaetronic? Absolutely 100% nothing! Reggaetronic is made possible through partnerships with outstanding national, regional, and local sponsors. They allow us to put on one heck of a show to all who attend. How can I become a sponsor of Reggaetronic? Do I need a boat to attend this shindig? Yes! This 100% floating festival on the lake presents a uniqueness not seen in traditional festival configurations. Because of this you need a boat…or a friend with one. I guess gas powered doughnut floats might be acceptable too. Contact us about that one though. There are not public shuttles to and from the festival. I want to get a good view right in the front row, can you help me with that? Aye aye captain! We do have reserved VIP front row parking available. You can reserve your space and secure an awesome view to the show. VIP front row spaces are $250* per boat. Front row spaces are very limited so it is HIGHLY RECOMMENDED YOU ACT FAST! Spaces can be secured on our website. General parking is available on a first come first served basis, so it is suggested you arrive early the day of the show. *Absolutely no refunds or exchanges on front row parking. If I have front row parking reserved, is there anything I should know? YOU MUST BE PARKED ON THE FRONG ROW BY 11AM!!! Due to safety restrictions access to park in the front row after this time will not be permitted. We also urge our front row fans to stay through the duration of the show. We have created this area for our most diehard of fans. Because of how boats will be anchored and the way our front row parking lines are designated, leaving early creates a bit of chaos. So sit back, relax, and enjoy the sun, fun, music and the good vibes my friend. I’m coming from out of town, where should I stay? We will be posting more information on our website for festival affiliated discounted hotels rates for those that need weekend accommodations. Can I park my boat overnight? Please contact the Lake Murray Marina for rates and availability. You may also contact [email protected] for more information. Please include your vessel type and size (length and width) and your contact information. Yes! Contact [email protected] for more information. Boat transportation will be provided for all media outlets.